We want to thank each and every person that put aside their valuable personal time when they committed to attending this weekend’s Pro-Test rally in Westwood. Your agreement to participate is a testament to your commitment to scientific research and to the scientists who have been targeted at UCLA. Our real goal was to positively change the climate for researchers at work and at home, where protesters are conducting their campaigns of terror. Counter demonstrating was but one way that this can be accomplished, and indeed, we believe a multi-faceted approach is required. Your commitment to this demonstration has evoked a renewed motivation in the University to work with us to create new strategies to bring under control the activities of animal rights extremists who insist on conducting campaigns of harassment, intimidation and threats against scientists and their families. At the recommendation of the University and to give these strategies an opportunity to develop and take effect, Pro-Test for Science has decided to defer the event planned for this Saturday. We want to thank our supporters, and those who may object to aspects of the work but still hold that moral disputes ought to be resolved in the court of public opinion by civil debate. We will continue to express our expert views to the public so that society can take informed decisions in matters of basic, medical research and public health. 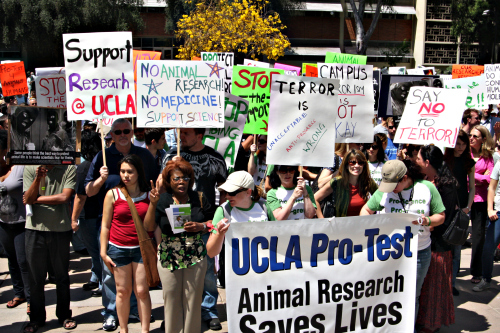 Posted on February 13, 2014 February 13, 2014 by EditorPosted in Campus Activism, NewsTagged david jentsch, pro-test for science, ucla. On a visit to the UCLA medical library and reading through the protocols of experiments done on animals I consistently found phrases such as: “These are only the results of injecting tumors in dogs. We don’t know what the results in humans will be.” and “These tests were done on rabbits and won’t predict what will happen in humans.” Obviously vivisectors know the basic fact, that because all species are different from one another physiologically and react differently to drugs, animal experiments cannot be extrapolated to humans. Unfortunately, there are enough sadists masquerading as scientists who are only too happy to lie about the validity of animal experiments in order to have the chance to inflict pain and death on animals and earn money in the process. Sadists do not care about human life or animal life. They find their pleasure in the daily brutality of their useless, pointless, vicious jobs. Where were you cockroaches on 2/15? Did your big daddy bosses at school castigate you for the ignorant, abusive spectacle you presented at your barbaric counter-protest? You cure NOTHING and you KNOW it. Just look at vivisector Davy boy. He obviously knows nothing about human health. Bloated bellies and pasty, sallow skin are a sign of unhealthful diet and a clarion call of impending disease and untimely death. You vile parasites do not know or care that ALL the major degenerative diseases can be prevented and reversed. Most cancers arise from decades of deficiency and toxicity. Our bodies will always work toward homeostasis until the constant toxic overload becomes so overwhelming that they finally give up and into disease — and even then, in many cases, health can be regained NATURALLY if allowed to do so. Subjecting primates to poison drugs is a bogus, useless practice, but, hey, as long as the grant money keeps rolling in, you non-scientists can dwell in affluent neighborhoods on the backs of those poor animals who are NOT biological models for humans. We still stand with you. Good luck with the new developments. I hope they can finally bring some sanity to this issue.